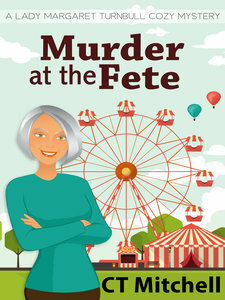 UK born Lady Margaret Turnbull, the owner of Lawler’s Loft bed and breakfast, is a guest culinary judge at a village fete in Bangalow, Australia when a patron drops dead; poisoned after sampling a prize winning strawberry tart. Detective Tom Sullivan investigates and initially diagnoses that Mrs. Davies died from a heart attack. But village busy body and part time woman sleuth Maggie Turnbull has other ideas, which to the annoyance of Detective Sullivan are usually right. “Poisoning is not random. It’s a private, personal affair” is Maggie Turnbull’s credo for which she must untangle a web of lies and secrets that will require her to re-visit a 30 year old case to catch today’s perpetrator. Mystery novel Australian author C T Mitchell masterfully creates a feast of twists and turns in this culinary mystery that will keep you guessing right to the end. Come sample this short story novella from a sleepy village Down Under.